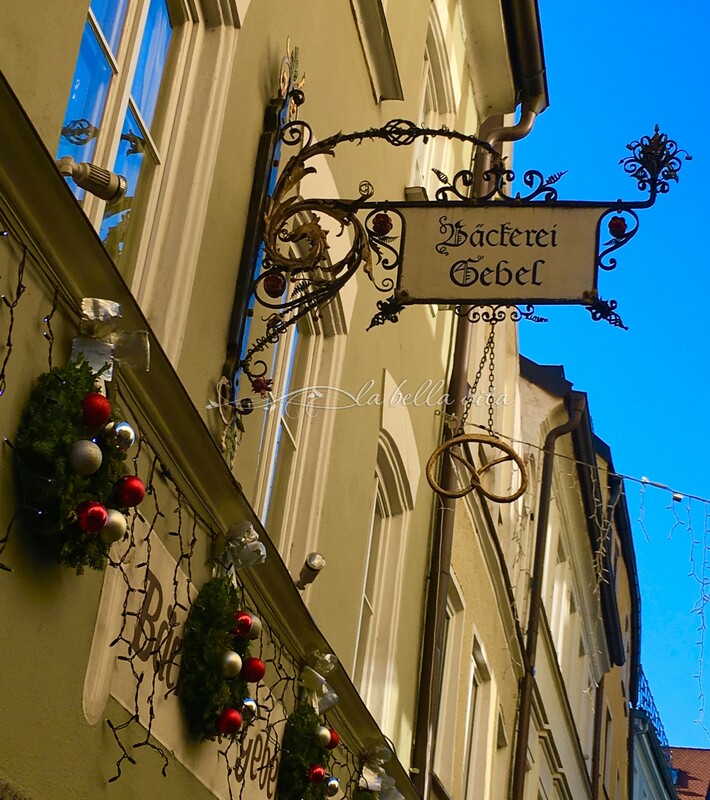 In Bavarian towns and villages, the signs on the outside of buildings are not only BEAUTIFULLY ornate in design, but will also ‘visually’ inform you of the specialty of the house – – in this case, pretzels are sold! 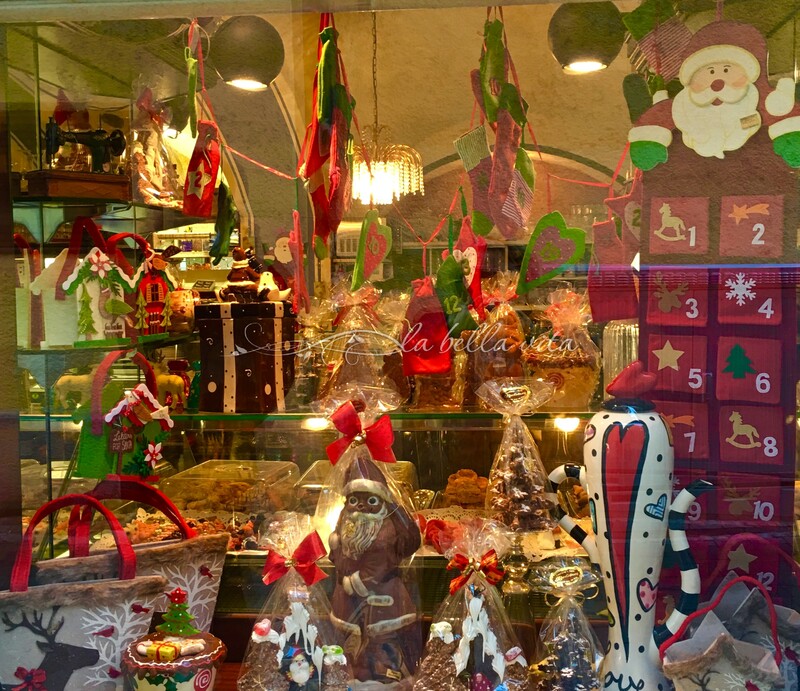 Spending Christmastime in Bavaria has always been a dream trip for me! 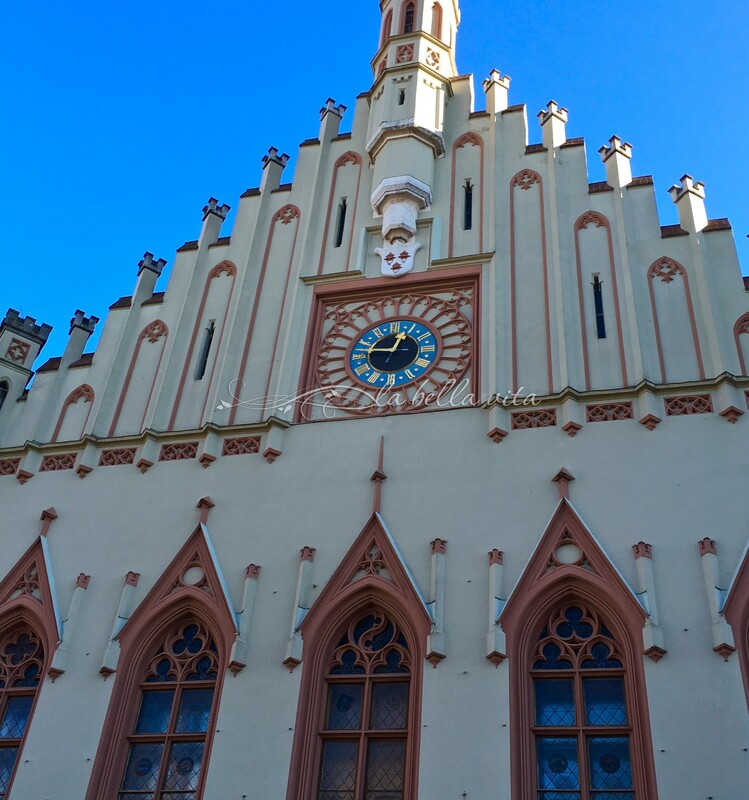 The chance to visit and experience this beautiful region in Germany was given to me this month when I was invited to teach a brief marketing seminar at Landshut University, a small school in the original capital of Bavaria. 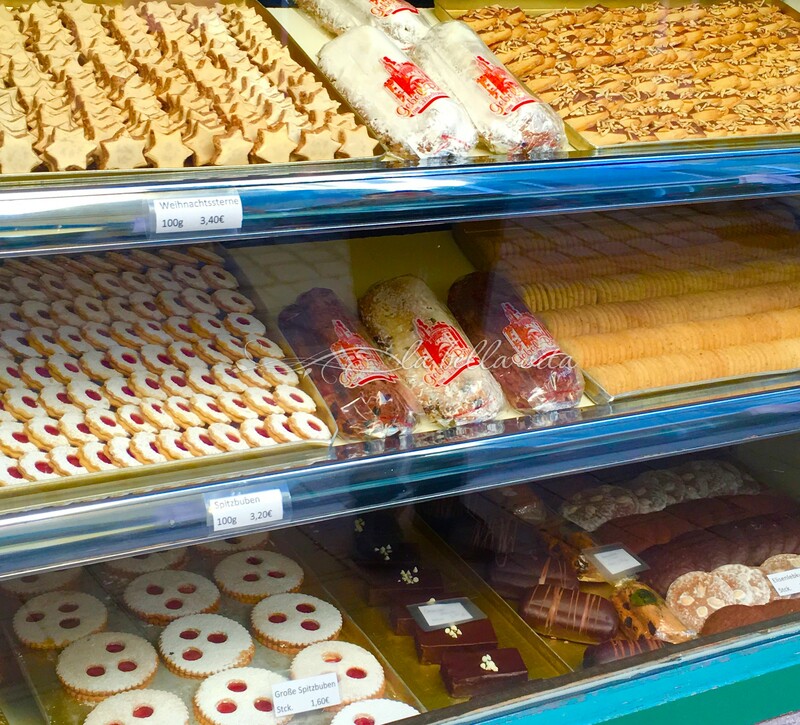 This is a town of medieval fame and the people preserve their historical culture in beautiful and delicious ways! 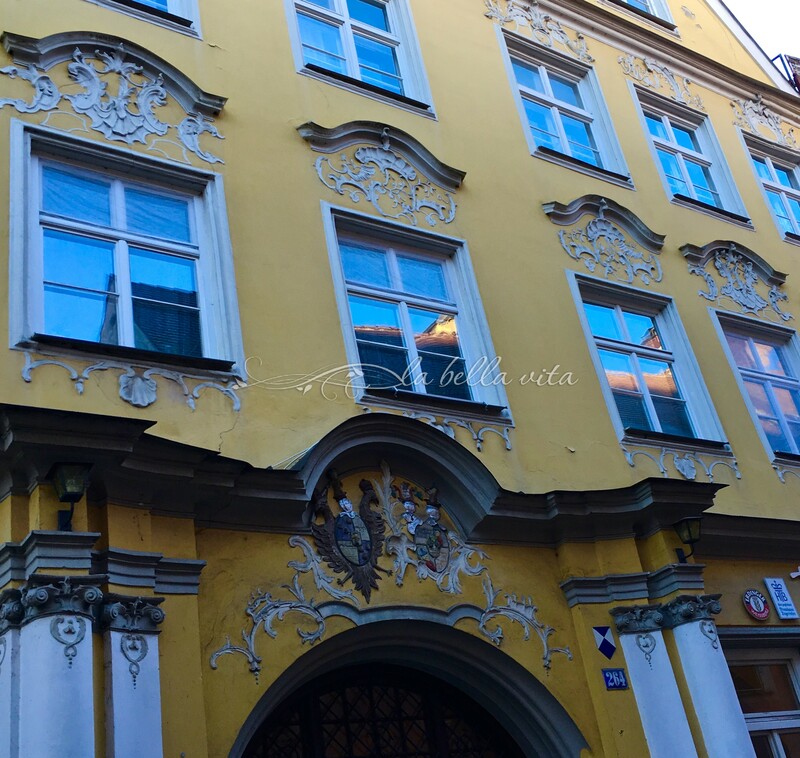 I took a stroll along the streets of the ‘old town’ streets and was greeted with gorgeous preserved buildings from the 1500’s. Ornate architectural embellished design, much with reverence to the Blessed Mother Mary and other saints. 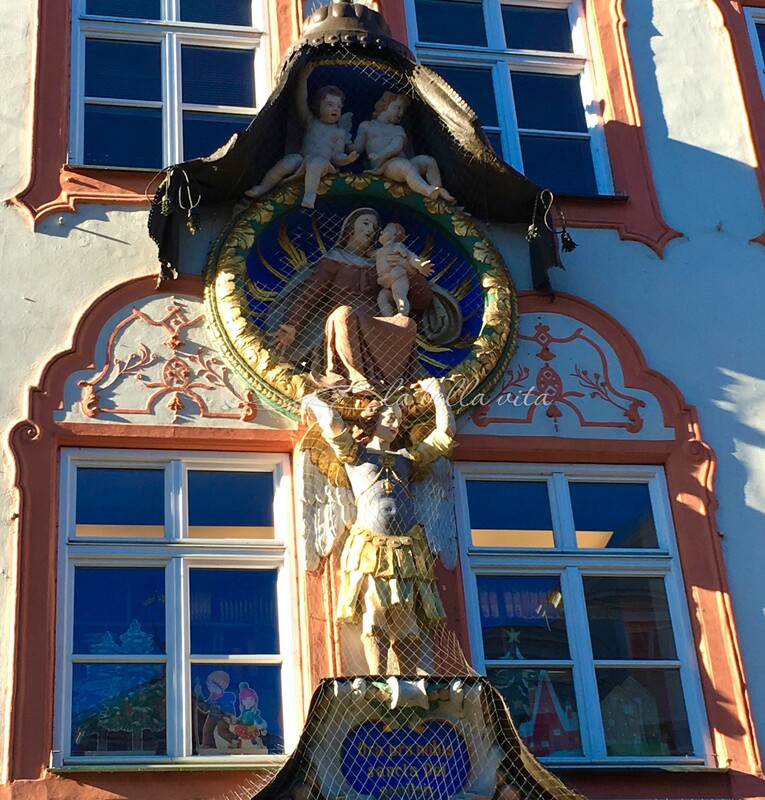 Bavaria is a very strong Catholic region and visual tributes to the Christian Faith are everywhere. I have more photos of the unique architecture of this town at the bottom of this post, because let’s move on to what so many of you read my blog for: the food! 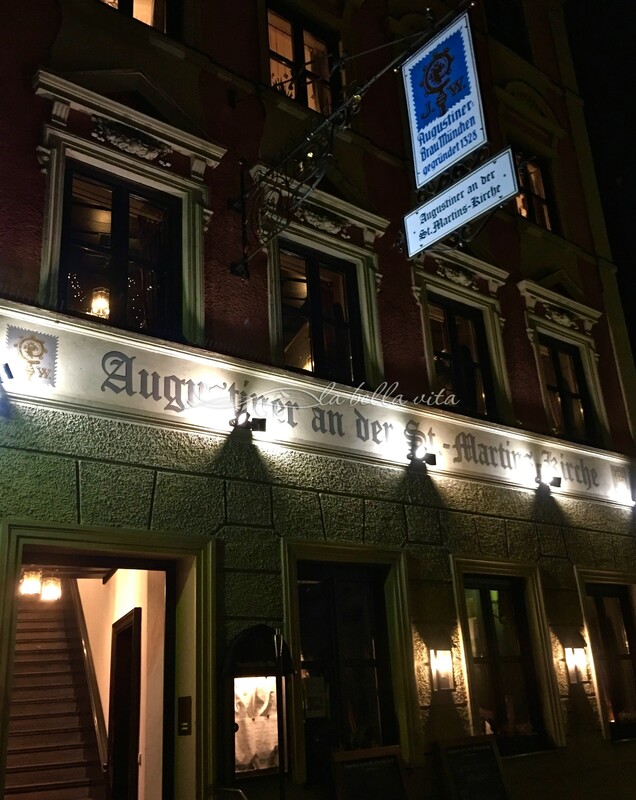 I asked to be taken to a place that was totally authentic in Bavarian fare and was taken to an ancient tavern, “Augustiner an der St. Martins-Kirche. The evening hours had already set in, so my photos are a bit on the dark side. Still an amateur at this natural lighting photography thing . . . give me some tips if you’d like! 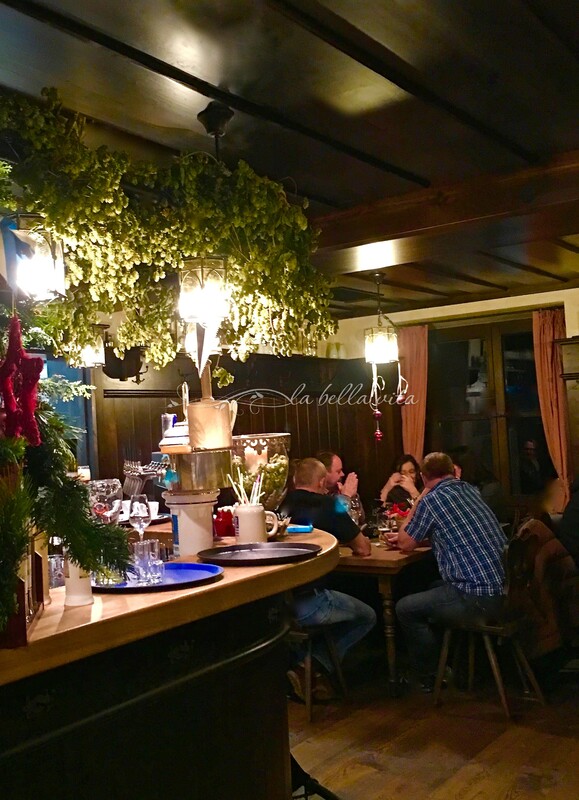 An authentic and ANCIENT, Bavarian tavern! 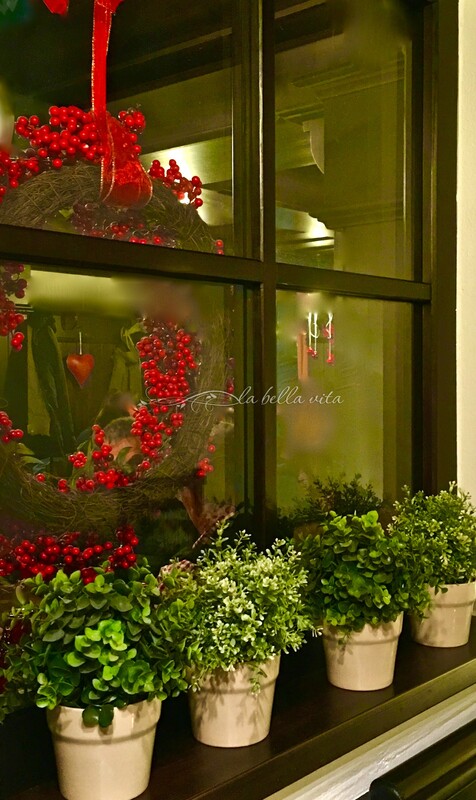 Outside of the tavern, simple Christmas decorations grace the window inviting patrons to peak inside the window . 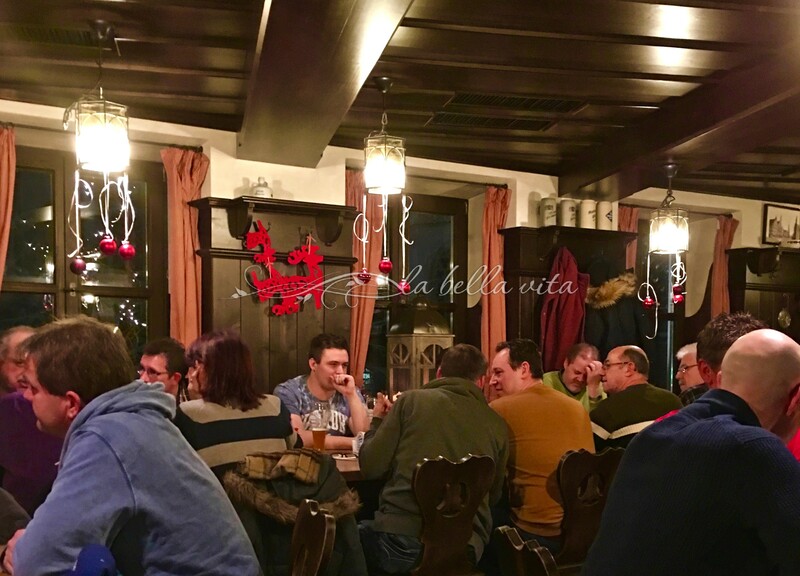 . . in which people are laughing and enjoying LOTS of delicious, locally brewed German beer. I love the simplicity of Christmas decoration in Germany !!!! Upon entering the tavern, the dark wood ceiling and floors create an inviting feeling of warmth and intimacy. 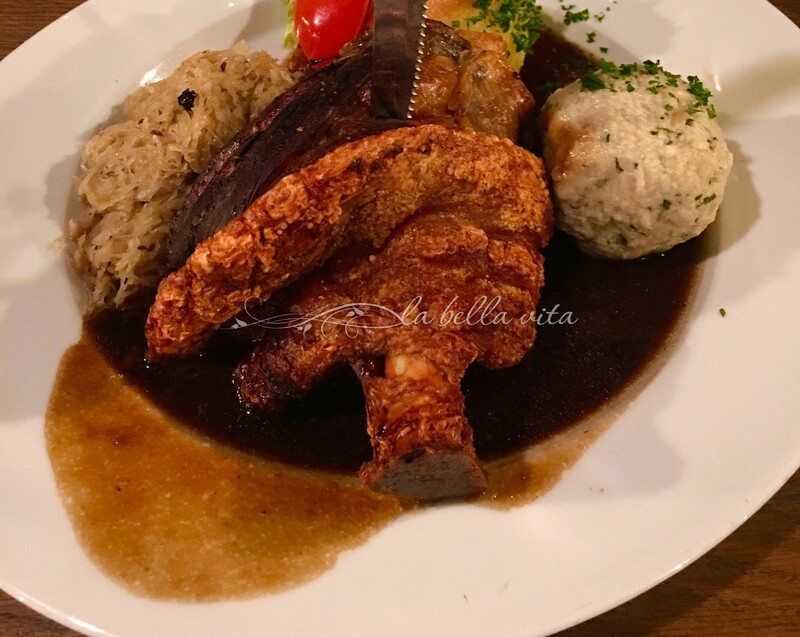 I ordered the Pork Knuckle (on the bone) in Dark Beer Sauce with Potato Dumplings. IT WAS AMAZING! The portion was so huge that it looked like it would be impossible to eat by myself. But after slicing into it and enjoying the moist, juicy, perfectly seasoned pork . . . I devoured the whole thing just like a German pig! I was almost embarrassed of myself for eating such a large piece of eating, but this was truly unbelievable! So incredibly juicy, and irresitable to stop noshing on! If you’re wondering about the taste of the dark beer sauce . . . there was no taste of beer at all, the alcohol cooks out of the sauce and leaves only a velvety smooth pork sauce. 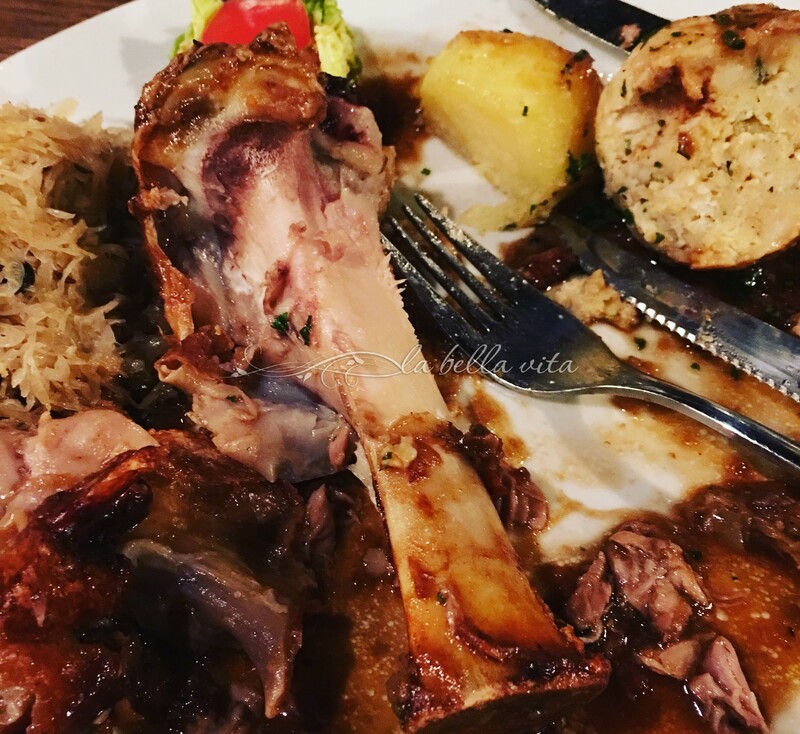 This Pork “Knuckle” on a Bone was so delicious that I literally ate it down to the bone! — Too bad my doggie wasn’t around to enjoy this huge bone! You’d think that I wouldn’t have any room left for dessert, but I was told that I needed to enjoy the local fried apple fritter specialty, “Apfeljucherl”. 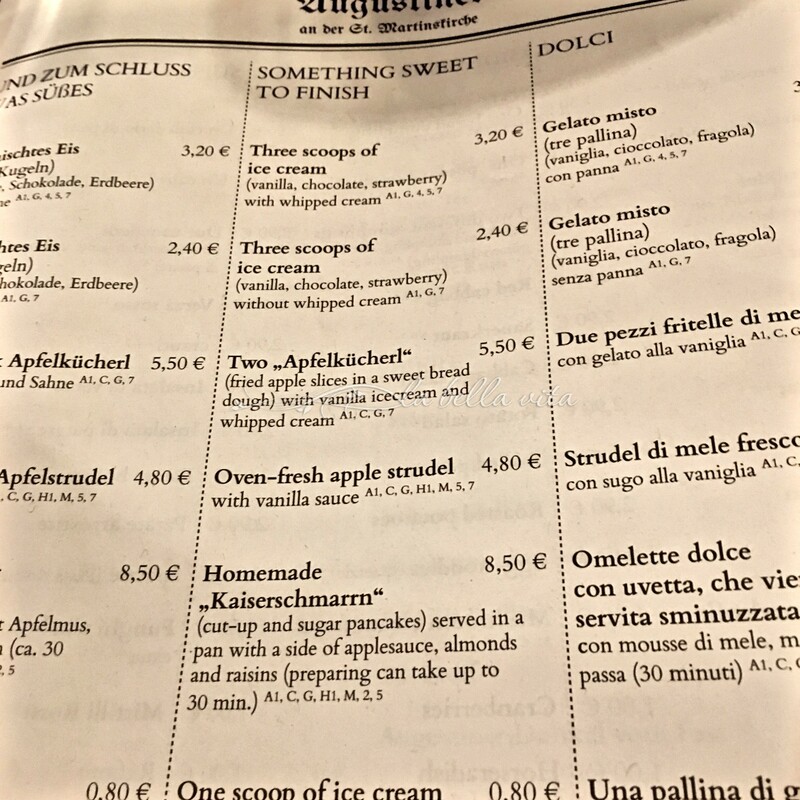 The menu is written in German, English and Italian. These are so delicious, I could have eaten another serving! 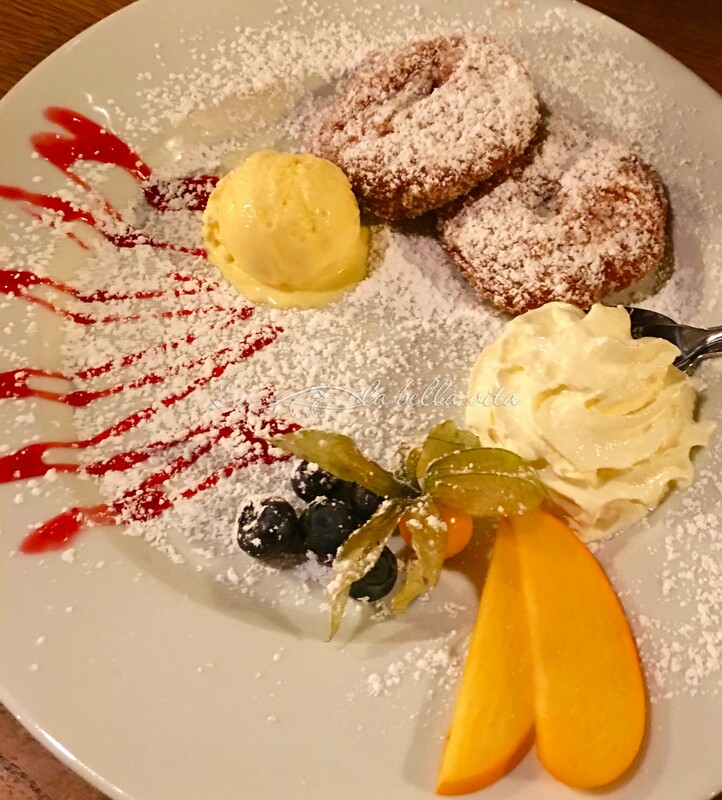 Perfectly fried, no grease, filled with sweetened apples and cinnamon, dusted with powdered sugar and served with a special Bavarian cream and a scoop of vanilla ice cream, with fresh fruit drizzled with raspberry sauce! I’d book a special plane flight just to enjoy this meal again if I could afford it! Unforgettable! 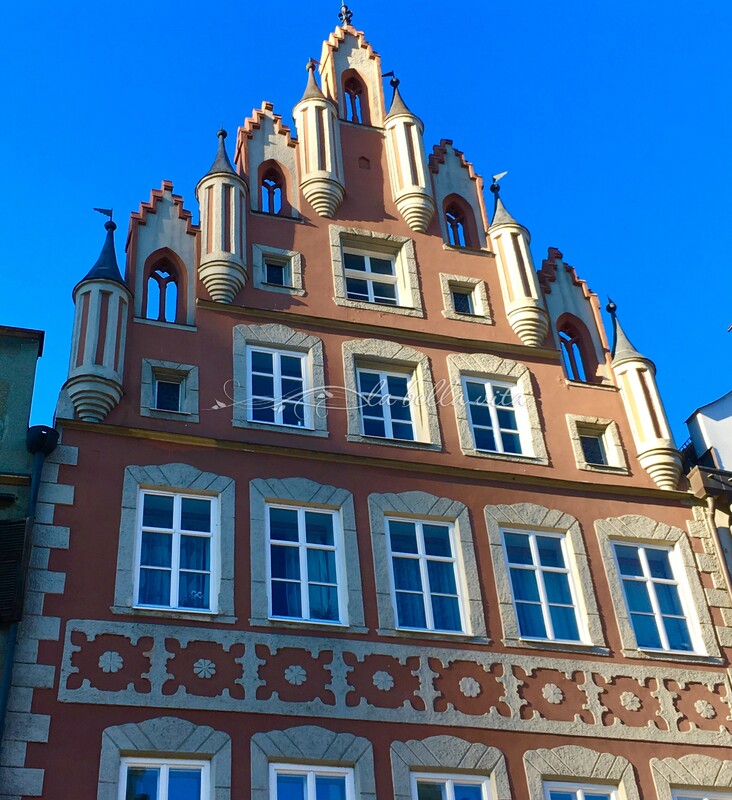 Here are just a few more shots of the unusual architecture in Landshut, Germany and then I’ll take you on a little Christmas window shopping photo shoot. It was Sunday, so all of the shops were closed. But the windows tell a story of their own about the German’s flare for Christmas. 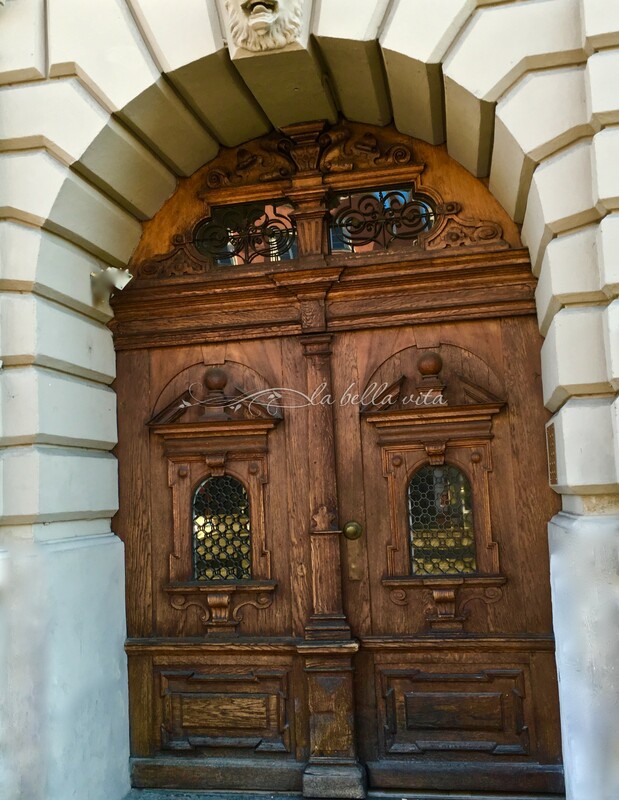 Beautiful Doors from the 1500’s! 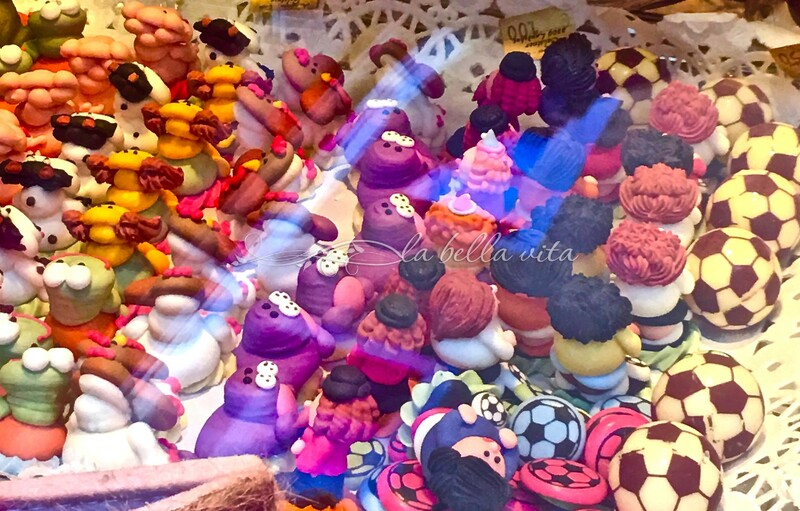 Italians are known for their expertise in ‘marzipan’, and it was “sweet” to know of the German’s love of marzipan too! 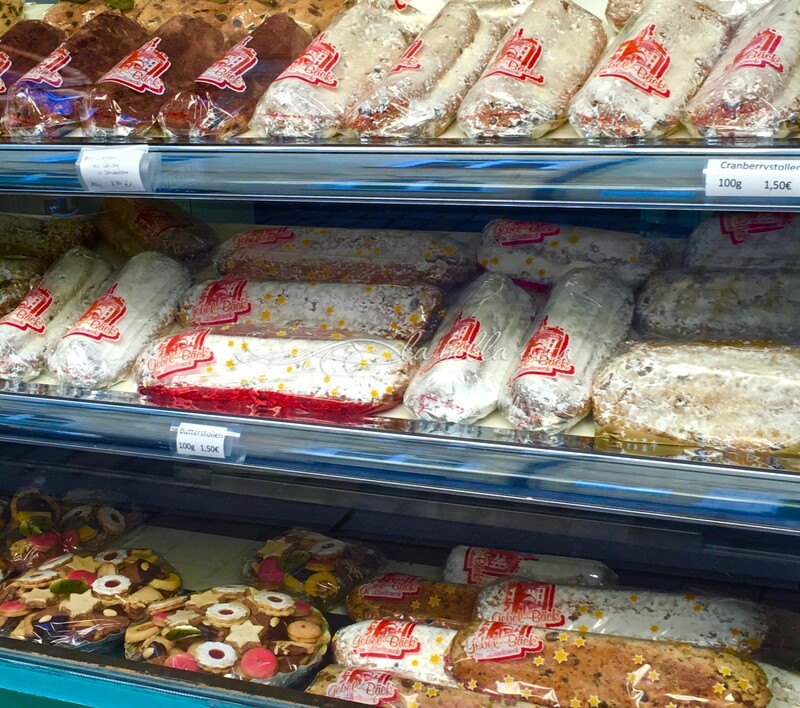 Stollen in endless flavor combinations! 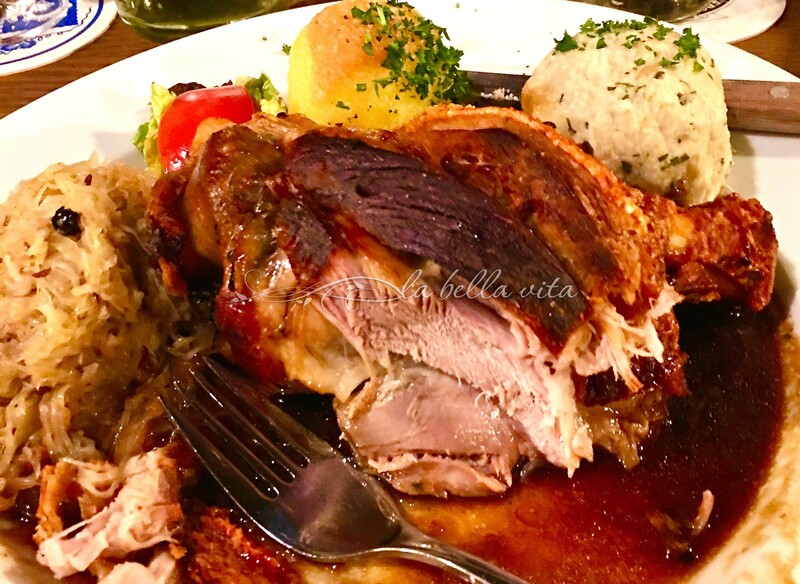 Well, I hope that this first post on my trip to Bavaria helped you experience it either for the first time or if you’ve visited several times, I hope it brings fond memories of your time there. I will be posting a series of posts about the week after my teaching ended and when my husband joined me to tour Bavaria and Austria. Before I close, I wanted to let you know that this small city of Landshut, Germany is famous for its massive reenactment of a medieval wedding. Everyone in town dresses up in period costume and enjoys many festivities. You can find more about this festival here. “The former capital of Bavaria makes history come alive: In June and July 2017 far more than 2000 citizens relive with enthusiasm the whole splendour of the late Middle Ages wearing costumes tailored true to the original. Celebrations take place on four weekends for the wedding in 1475 of the Polish King´s daughter Hedwig to the Duke of Wittelsbach George of Bavaria-Landshut. From this time one can still see the same backdrop of bourgeoise houses, the steeple of St. Martin`s Church and the Trausnitz Castle. This pageant lures one to various events such as the public “Tavern in the Steckengassen” to the “Masque”a burlesque entertainment in the evening. More enactment with “Court Music of 1475” which awakens medieval music to life. On all four Sundays watch the bridal procession, and then enjoy watching the knights tournament, jousting just as in the times of the Rich Dukes. It was a lovely trip to Bavaria; however, nothing can compare to Italy! Love all the photos. I’ve never been to Europe, so it’s all new to me. I am so glad that you’re enjoying these photos from Bavaria. I hope that you will be able to visit someday. You’ll love it! 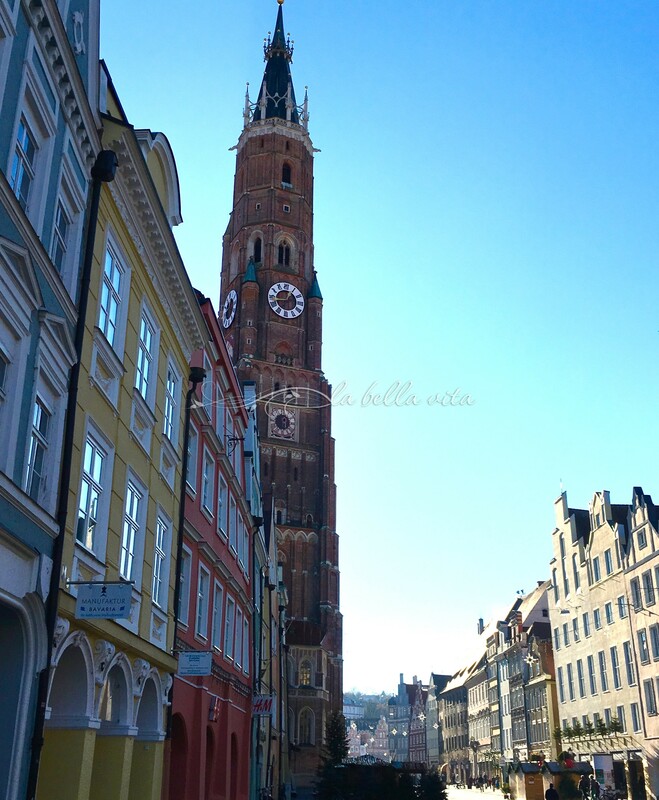 Oh yes, your photos do bring back memories of our visits to Landshut…love the architecture of the town. I know you are having a great time. How incredible that you have visited this town of Landshut, that I have literally never heard of, nor has anyone else that I know! I hope to return for more time to explore someday. You never know! That meal looked AMAZING. I’m not typically a sweets person, but the apple fritters sound to die for. Like you Mindy, I can pass on the sweets too. But I had to have something that was so traditional to the region and boy, am I ever glad I chose to order these. AMAZING! I wish I had the recipe! 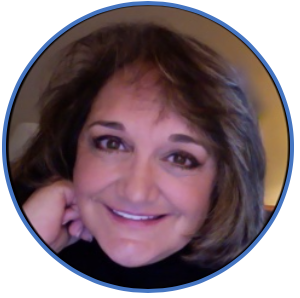 What an amazing trip, Roz! I’m so glad you are sharing it with us. The architecture is so different than anything I’ve seen. And the food looks incredible. I am looking forward to reading more about the rest of your trip! You got that right, Shari! Completely different architecture and definitely different food, but oh so delicious that I never knew!